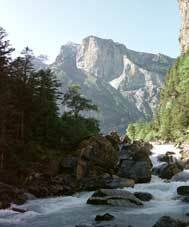 Kandersteg is the central village in the Berner Oberland & on the Cross-Swiss Walk. By Car - take the road up the Kandertal from Spiez on Lake Thun, which can be reached by the motorway from Bern. You can also approach up the Rhone Valley by driving up to Goppenstein in the Lötschental & take the train, which has a car ferry through the Lötschberg Tunnel. By Train - Kandersteg is on what was the main BLS line from Bern to Brig, which now goes through the new Lötschberg Basis Tunnel. Make sure your train goes the 'old way' to the old tunnel. All of those trains stop at Kandersteg. ...I have often stayed in the National (south of the town but has the Youth Hostel attached) or the Spycher, which is posher & not the Barn the name suggests. 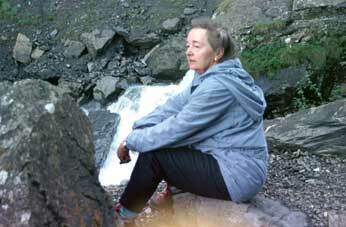 In 2010, I stayed at the Hotel zur Post in the village, which was much improved since I stayed there in 1982. 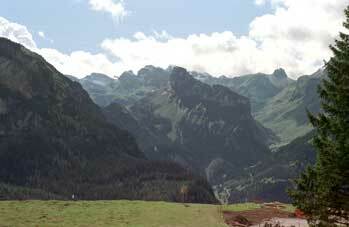 This village is inconveniently near the edge of LK 263 'Wildstrubel' & LK 264 'Jungfrau'. To do the tour described later, you will need both maps. 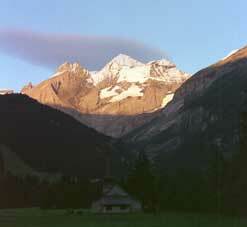 Walks in and out from East & West are described in the Cross-Swiss Tour. You can also walk in pleasantly from Frütigen (starting along the river Kander) on the main train line, rather than train all the way in. 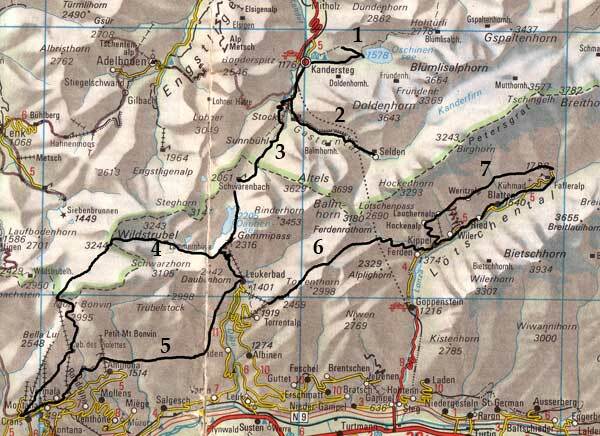 This map is copied from the Official Map of the Automobil-Club der Schweiz, (with their permission) which is on this link but not to scale. Lazy day. This walk reverses the Cross-Swiss Walk. Leave the village just North of the centre to the East on a path which goes past an enchanting old church & go past (or take) the chair lift. The path wanders up through the woods to the beautiful lake (the Oeschinensee) with the Blumlisalphorn 3664m (but looking much higher!) behind. There is a café by the lake. Going back, you get a better view to the West by going up to the chair-lift top station. A beautiful, hidden valley. Walk south along the road towards the Stock. The path goes off left 100m before the cable car to the Stock and soon up a sinister gorge with a cataract on your left. There is a road above you. Ignore it. The view becomes increasingly interesting as the Altels 3629m appears ahead of you. 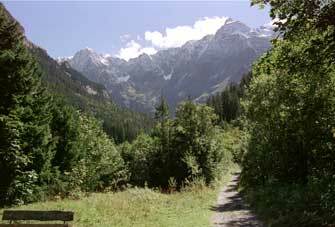 Then, the valley turns left & opens out into glorious views up to the Hockenhorn 3293m with the Balmhorn 3669m on your right. Follow the path to the right, marked 'Waldhaus' (refreshment point), after which trend left on the obvious track up the valley to Selden, the village at the end. (The other track at the Waldhaus is the steep 'struggle' up to the Gemmi Pass, which you may want to use as an alternative to the Stock path described on the Gemmi Pass page). 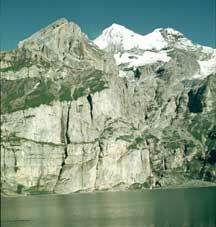 From Selden, the path bears left (NE) & goes to the Kander glacier, up which there is a path for those suitably equipped to the Mutthorn Hut at 2901m. Otherwise, either walk back or take the tiny mini-bus for a scary ride back to Kandersteg. Without a map, you would never guess this valley exists. Contact: Ken Baldry, 17 Gerrard Road, Islington, London N1 8AY +44(0)20 7359 6294 or e-mail him URL: http://www.art-science.com/Ken/Alpine/KtoFtour/index.html ©2001-2013 Ken Baldry.